RoyalEnfields.com: Can you spot what's different about this Royal Enfield? Can you spot what's different about this Royal Enfield? At first glance, this looks like any Royal Enfield Military model. A photo of a very unusual Royal Enfield Military arrived by email recently from Adam, of Brooklyn, N.Y. I know, it looks pretty standard in the photo. Familiar color, familiar features, left-shift — WHOA! That left-shift lever is coming out of the primary cover, instead of ducking below it, as four-speed Royal Enfield shifts do in the U.S. This appears to be a very clever way to cut out some of the sloppy linkage that plagues left-shift four-speed Royal Enfields in the U.S. Even more unusual: Adam wrote that he bought his Royal Enfield directly from India, through Nova Classics. "They refurbished the bike in India and then shipped it over to me," he wrote. " I paid extra to Nova Classics to have the shifter moved to the left side. It was originally on the right but I didn't want to risk riding with an unfamiliar feel." Adam said his motorcycle is a 1978. 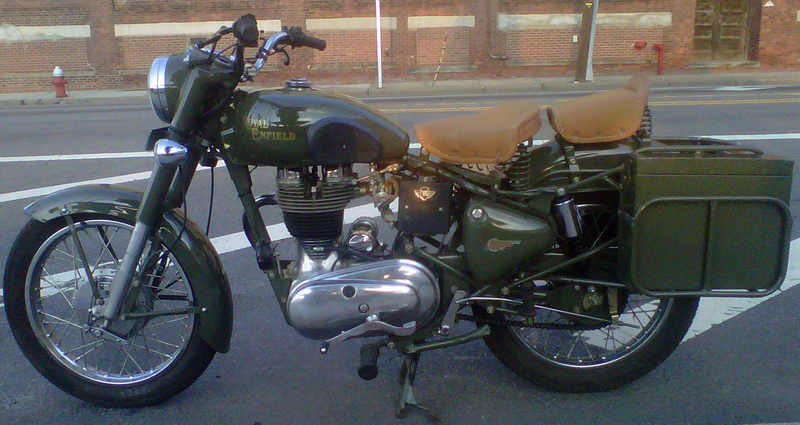 It looks very like one of the Royal Enfield Military models officially imported to the United States after 1995. But it's the left-shift that captured my attention. Someone at Nova Classics appears to have come up with a neater solution than the factory did. Adam is a legal aid attorney who spent a six-month sabbatical in Nepal. "When I was in Nepal, I fell in love with the Enfield look and sound (but not the unreliability!). I bought a brand new 350cc bullet when I was there and sold it when I left. When I returned to the states, I found Nova Classic online, and purchased the 1978 rebuilt one in the pic for $3,600. I ordered it in March, and just got it this week (August). "Had no problem with customs/delivery/registration etc. I would say that I had to pay an additional $1,200 for customs, delivery, registration and taxes." "Getting the vehicle acceptable for registration in the U.S. is quite another matter. It's complicated and the best I can determine, the process will cost much more than the vehicle is worth. If you're considering it, do the homework. Visit www.NHTSA.gov and then call your motor vehicle department. And then decide if the price offered for the bike is really worth it." "As a general rule, a motor vehicle less than 25 years old must comply with all applicable Federal motor vehicle safety standards (FMVSS) to be imported on a permanent basis." There is much more to the NHTSA requirements, of course, much of it very daunting. But this suggests that, identified as a 1978 model, Adam's motorcycle at least leaped that first hurdle. Hey Adam, whereabouts in BKLYN? I'm a fellow Bulleteer in Windsor Terrace (by Prospect Park). Good luck with the bike. A very tidy way to make it LF shift...although I prefer my RF shift Bullet to the LF models,this is certainly an improvement over the factory shifter linkage...looks cool,too! That's neat & some good work is gone into it. Did the owner comment on any difference in shift quality? And if possible, post a shot from RH side too. Clutch on the left-side because the model appears as old model and clutch should be right-side. Check out NOVACLASSICS.COM and in the gallery page all u see is always avilable, if not they make it for you and deliver to u. Pretty Cool. And dont worry about legal confusing stuff, it all comes down to if bike's got a brake and flashers its good enough. So dont let those ännoymous""confuse you. Dear TJ: What you say may be true. But those of us who have spent hours in line at the Department of Motor Vehicles for ordinary things like license renewal are naturally a little bit shy about trying to certify a motorcycle ourselves. Nova Classics has some lovely bikes on their gallery page, but some of the images are "camera dated" 2007 and 2008. Hi I just got mine thru NOVA. Iys a std 350 Enfield Black. it took all about 30 min to clear all customs, and similar in DMV. Maybe your time in DMVs are due to poor/incomplete dox u get with the import which people do for lowest price hunting and then complain.